Bumper stickers in Thailand are make for an interesting language lesson when you're caught in traffic. 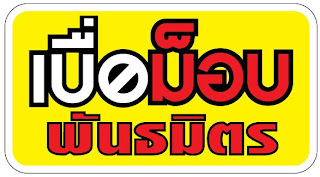 Apart from the typical เมาไม่ขับ "Don't Drink and Drive" and เรารักในหลวง "We Love the King" stickers, one can typically count on Thai bumper stickers to be one of two things, and frequently both: clever and filthy. One clever sticker I saw recently made me chuckle. On government vehicles you'll see the lettering ใช้ในราชการเท่านั้น "For Official Use Only" below the logo for whatever department it belongs to. A taxi had adorned its bumper with: ใช้หนีราชการเท่านั้น "For Fleeing (from) Officials Only", a play on the usual phrase by replacing ใน /nai/ with หนี /nii/. If you're sensibilities aren't too delicate, take a look over at this website that Doug Cooper put up sometime during the Clinton administration. It's a large collection of Thai bumper stickers. Most are transcribed and many are translated. Some of the translations are wrong, and you have to download a special font to see the phonetic Thai, but it's still a nice collection. The content is not the type of Thai you'll want to use in polite company, if ever. Be warned. "(I teach) wedding night lessons"
Another popular one I've seen so many times now that I began wondering if I'd gone colorblind. The gimmick is sticker lettering on the rear of the car saying รถคันนี้สี(X) "this car is (color), filling in the blank with any color that the car isn't. The lettering is often the color the car purports to be, but not always. 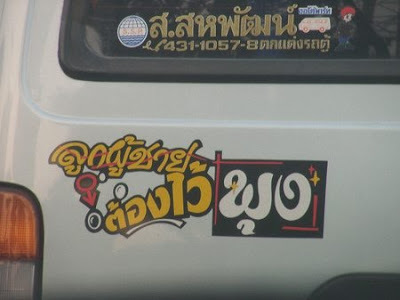 A typical example: a pink taxi might have lettered on its bumper: รถคันนี้สีเขียว "this car is green". I looked around on some Thai message boards, and many people claim it's done to แก้เคล็ด, as Thais say -- to ward off bad luck. I'm sure plenty do it to be ironic or trendy. "Real men have a paunch." The classic Thai grammar written in Thai is called, simply, หลักภาษาไทย "Principles of the Thai Language", by กำชัย ทองหล่อ. First published in 1952, the book joins the select club of Thai publications still in print after 50 years. Though out of date in some respects, it remains a useful book. The book itself tells nothing about the author except that he received an honorary doctorate. So what did I do? I Googled him, of course. Most of the following below is translated from this brief bio. Nai Kamchai Thonglor was born in a boat on the Chao Phra River, at Tambon Takhian Luean, Amphoe Mueang Nakhon Sawan, Changwat Nakhon Sawat, on May 17, 1906, to Nai Thongkham and Nang Srimueang. As a boy he studied at Wat Ko Hong School (โรงเรียนวัดเกาะหงษ์). After finishing primary school, he continued his studies at Nakhon Sawan Boarding School (โรงเรียนประจำจังหวัดนครสวรรค์), finishing grade matthayom 3. After that, he became a novice at Wat Thep Sirintharawat (วัดเทพศิรินทราวาส) in Bangkok. He studied Pali, passing parian level 3, then ordained as a monk at the same temple, and eventually completed parian level 5. After leaving the priesthood he taught Thai at Intharasueksa School (โรงเรียนอินทรศึกษา) and began to earn acclaim. The headmaster at Bangkok Christian College (โรงเรียนกรุงเทพคริสเตียน) noticed his work and invited Kamchai to teach there. While at the school, he began researching methods for teaching Thai and penned a well-known Thai language grammar and many other books. Kamchai left Bangkok Christian College after 25 years teaching there. The Faculty of Education at Chulalongkorn University then invited him to join their staff, teaching Bachelor's and Master's students. And starting in 1961, he taught the Crown Prince and Princesses at Chitrlada School. Kamchai married Nang Sawai, and they had seven children together. During his career he received several royal insignia and decorations: Grand Companion (Third Class) of the Most Illustrious Order of Chula Chom Klao (ตติยจุลจอมเกล้าวิเศษ), Knight Commander (Second Class) of the Most Exalted Order of the White Elephant (ทวิติยาภรณ์ช้างเผือก), and the King's Royal Cypher Medal (เหรียญรัตนาภรณ์). He also received the King's Personal Medal (เหรียญส่วนพระองค์ (ภ.อ. )), the Senior Teacher Medal (เหรียญครูอาวุโส), and was bestowed an Honorary Doctorate in Language and Literature (ปริญญาดุษฎีบัณฑิตกิตติมศักดิ์ สาขาภาษาและวรรณคดี) from Chulalongkorn University. Kamchai died of a blood infection on August 26, 1985, at the age of 79. I've started seeing this sticker around, on the back bumper of taxis and such. "Sick and tired of the PAD"
Preface: With the political conflict in full swing nationwide, it seems a little odd to continue posting without even acknowledging it. The fact of the matter is, it's business as usual for virtually everyone. The price of the baht is falling, tourism is headed for the toilet, and the government is in a tight spot as the lunatics attempt to wrest control of the asylum. But even with the state of emergency declared in Bangkok and several countries issues advisories against traveling to Thailand, you could be within a couple blocks of Government House and PAD central and be none the wiser. Today is two-for-one day at Thai 101. 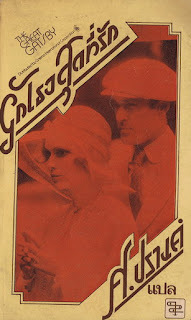 You get samples from two (count 'em) translations of that perennial favorite of high school English teachers, The Great Gatsby, by F. Scott Fitzgerald. I read this for class in high school, and then again my freshman year of college. I enjoy me some Fitzgerald. 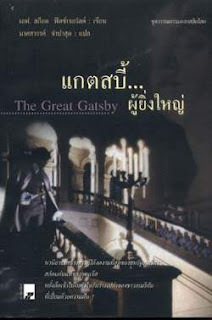 And I have two Thai translations of Gatsby, actually. One published in 1975 and another in 2003. The 1975 volume appears to have been a rush job (again, probably because it was a movie tie-in). The first ten pages are printed in mixed-up order, and quick comparison with the English reveals that the translation leaves things out here and there, including the book's final sentence. Bizarre. 1975: พ่อบอกผมว่า "เมื่อใดก็ตามที่เธอคิดจะวิพากษ์วิจารณ์ผู้อื่นละก็ขอให้ระลึกอยู่เสมอว่าคนอื่น ๆ ในโลกนี้น่ะ ไม่มีโอกาสดีอย่างที่เธอมี"
2003: ท่านสอนไว้ว่า "เมื่อใดก็ตามที่แกรู้สึกอยากตัดสินใครสักคน ขอให้จำไว้เพียงแค่ว่า ไม่ใช่ทุกคนในโลกจะมีโอกาสทัดเทียมแก"
He didn't say any more but we've always been unusually communicative in a reserved way, and I understood that he meant a great deal more than that. In consequence I'm inclined to reserve all judgments, a habit that has opened up many curious natures to me and also made me the victim of not a few veteran bores. The abnormal mind is quick to detect and attach itself to this quality when it appears in a normal person, and so it came about that in college I was unjustly accused of being a politician, because I was privy to the secret griefs of wild, unknown men. As I do more of these comparisons of translated texts with the originals, I must reiterate: it's hard to translate literature. In some places both translators just don't seem to quite get the author's gist, which can have far-reaching affects for an overall translation. The story's narrator, Nick Carraway, opens the book by explaining that due to this advice his father game him, he is the (sometimes unwilling) confidante of many a person. Because he's not judgmental, people tend to spill their guts to him, like it or not. There are a couple of lines in this opening passage that show this. First, that his neutral nature "...made me the victim of not a few veteran bores." That is, sometimes being a good listener makes bores (i.e. boring people) talk your ear off. Also, that "...I was privy to the secret griefs of wild, unknown men". Even people he didn't know spilled their guts to him. Neither translation quite gets these details right. I guess it's because much is not said directly, but left for the reader to infer and interpret. So while the deft and clever use of language is what makes a book like this a classic, those same touches make it diabolically difficult to render in another language. Having done some further comparison, I prefer the 2003 to the 1975. Less literal, captures the feel of the English better. The language is a little more lively, a little more creative. And oddly, the 1975 version is missing portions of the final paragraphs of the book, I noticed. The book has a powerful ending, I think, and to see the last sentence entirely omitted from the earlier translation strikes me as odd, to say the least. I wonder if parts are missing elsewhere, too. โชกโชน = adj. experienced, having been through a lot. Unless there's something I'm missing, this seems like the entirely wrong word for 'vulnerable' in the opening line 'in my younger and more vulnerable years'. (Also used in the sense 'drenched, soaking wet'.) So what exactly does this วัยหนุ่มอันโชกโชน mean--his young 'wild' years? Perhaps the translator was thinking vulnerable as in prone to vice? I'm not sure. อยากรู้อยากเห็น = adj. curious, inquisitive. คุณสมบัติ [คุน-นะ-สม-บัด] = n. characteristic, quality. เหยื่อ = n. prey, victim. Okay, I'm all analyzed out. See you next time. The Thai text is even made to look like the English. Scott also made a recent post about other similar logo designs. Also notice that the Thai cover follows the then-standard practice of prominently featuring the translator's name, with the original author's name nowhere in sight. I think this started to change around the 1980s, but I'd have to pretty much everything prior to that you have to look in the frontmatter to figure out who wrote the book.